It’s a very long time since I last wrote about laundry problems. The Starry Laundry lost my patronage when they lost lost a duvet cover. Indeed, the Lebanese Laundry have, until this weekend, been exemplary in washing and ironing our bedding. The Starry Laundry recognised my bedding from similar white sheets belonging to other people, as my name was written in indelible ink on the makers tabs or on the inside of the duvet, bottom sheet and pillow cases. Unfortunately that did not stop it going missing on a permanent basis. The Lebanese Laundry operate a different system. 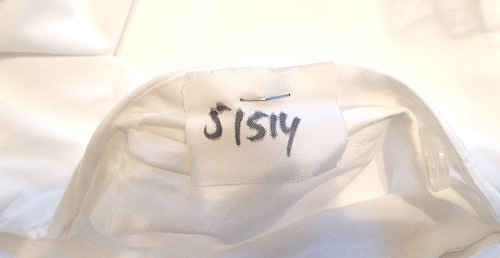 A small rectangle of cloth is written with the order number and it is then stapled to a corner of the sheet. Clearly something went wrong this week as although I had the correct number of bedsheets, the bottom sheet was not the same one I had left with them three days before. I am slightly embarrassed to recount that we only found out when our maid was unable to make a single sheet fit on a king-sized bed… but this is Qatar and who changes their own bedding? Whereas we shop at the more budget Zara Home, the wrong sheet was more expensive from the White Company. They appear to only sell things that are coloured white. It must work, however you have to consider whether cutting out goods in all the other colours of the spectrum is a sensible business model. If the sheet had fitted the bed I also wonder whether we would have known it was not ours. I inately felt that I would not have wanted to sleep in someone else’s bed sheet… yet every time I stay in a hotel I just do exactly that, without giving a second thought to all the goings-on that take place in hotel bedrooms. I took the sheet back to the laundry. They made an attempt to find it by disappearing round the back but returning ten minutes later to tell me they couldn’t find it but to come back that evening. I said that they should phone me that same evening when they found the sheet. They said they would. I have been in Doha longer enough not to expect the call… and of course, I wasn’t disappointed. I bought a replacement as we needed clean bedding for the night and in the expectation that my sheet was gone forever… Zara Home not the White Company. Today I headed to the Lebanese laundry after I finished work. After a short while in the back of the laundry, I was extremely surprised when they emerged with a white fitted bottom sheet. I checked it… on the small tab on the inside was my name, faded but it was definitely our sheet… so I now have an extra sheet, which at least gives me some flexibility if one goes missing again.